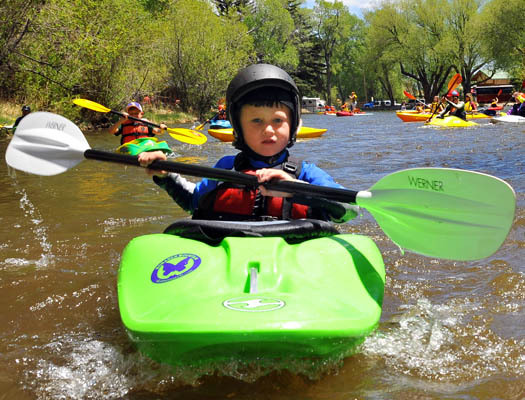 As part of this year’s event, CKS PaddleFest is partnering with the Boys and Girls Clubs of Chaffee County (BGCCC) and the Buena Vista Optimist Club in an effort to raise funds and awareness for local youth throughout the event. The event draws thousands of newbies and enthusiasts from around the region to learn, share, watch and celebrate what paddling has to offer. The multiple location venues include a flat-water demo center, on water education, river competitions, multi-sport races, free demos, and several other non-paddling and family oriented events centered on “all ages” participation. 12:00 PM – 7:00 PM – CKS Storewide Sale – 327 East Main St. (CKS Retail Store Location in Buena Vista, CO). 9:00 AM – 7:00 PM CKS Storewide Sale at E. Main St Retail Location (327 E. Main St.). 9:00 PM – 5:00 PM Boat and Bike Swap at CKS 327 E Main St.
9:00 AM – 12:00 PM- BV Open Class Amateur Kayak Competition at the Buena Vista River Park in South Main. 10:00 AM – 4:00 PM – SUP Stroke & Maneuvers With Dan Gavere – meets at RMOC booth next to CKS. 3pm-5pm – Children’s Bouldering Comp at the South Main boulders. 9:00 AM – 6:00 PM- CKS Storewide Sale. 327 E. Main St Retail Location. 9:00 AM – 5:00 PM- Boat & Bike Swap at CKS. 327 E Main St. Retail Store Location. 11:00 AM – 3:00 PM – Whitewater Kayaking Demo Center at the Buena Vista River Park in South Main. 2pm-4pm – Bouldering Comp at the South Main boulders. 2 PM – Kids, Kayaks and Groovers – Oh My! Float (2pm), Family Dinner (6pm), Slideshow (8pm). 4:30 PM – Youth Pond Slalom Race – A FUN kayak, SUP or canoe race for beginning and intermediate level paddlers. McPhelmee Pond. 5pm-8pm- Live Music, Food, and Guest Speakers – Bring the entire family to the South Main River Park for an evening of great music, food and drinks. 6:00 PM – Kids, Kayaks and Groovers – Oh My! Float (2pm), Family Dinner (6pm), Slideshow (8pm). 9am-5pm – CKS Storewide Sale at E. Main St Retail Location.